The other day I was looking through my great grandmother's old recipes, in search of her peanut butter pie. I got distracted along the way by some rather vile recipes from the 70s. I couldn't resist scanning them to share. 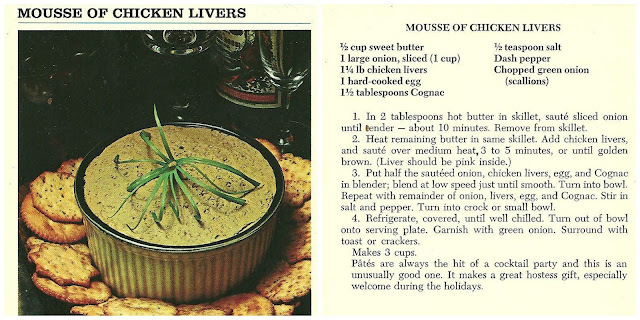 First off, the Mousse of Chicken Livers. Even the garnish in this picture is like a garnish gone wrong...a garnoctopus? Now some of you might think Tomato Aspic sounds tasty. Me? I don't drink tomato juice (although I do eat tomatoes), and I'm not big on congealed salads, so this looks pretty awful to me. I might, if hungry enough, pick out the olives to eat. Finally (now don't get too excited!) we have the ever desirable Prune Whip. Mmmmmmm. Maybe I shouldn't pick on prunes. Some of you probably like them. Me? You can have my prunes and raisins, I'll pass! Readers, would do you think any of these dishes sound like the sort of thing you'd like to eat? 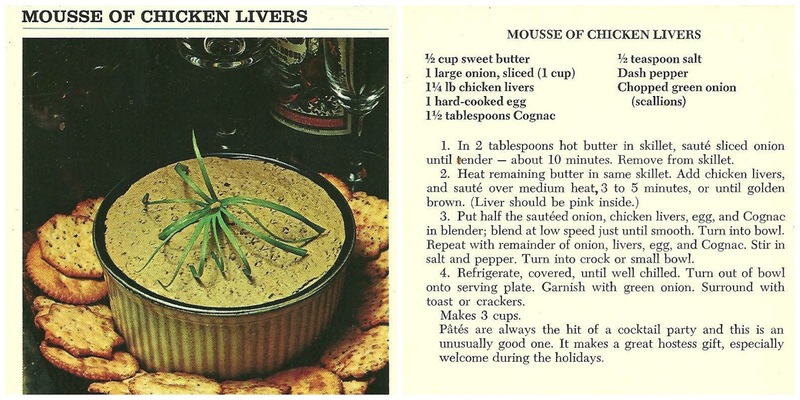 I like chicken livers, though I haven't eaten in a while.. not sure about the mousse though..
Just not the sort of things we have at our house either. 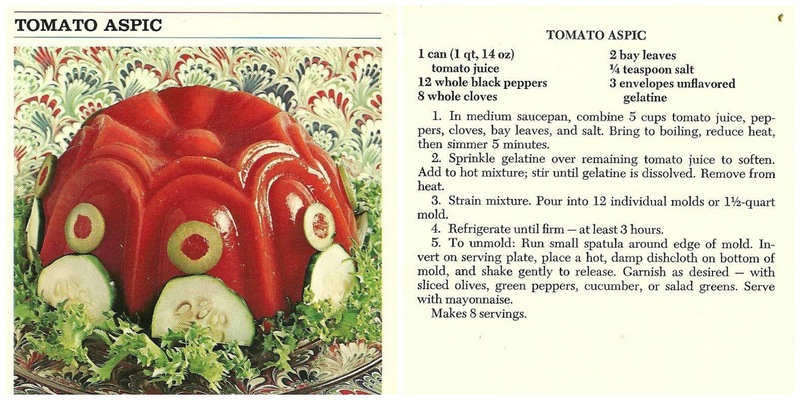 I agree with you about the tomato aspic, pick out the olives and I might pick out the cucumbers too. LOL!! Oooh gross...my mom used to make those molded desserts all the time...yuck, pooey. oooohhh. That first one is especially horrid! My great aunt would always have prune dishes for the holidays. It became a big joke among our family. I wouldn't consider myself a picky eater and I can't imagine any of these dishes being appetizing. Keep these handy in case you need to induce vomiting! Aside from the peanut butter pie which sounds delish, I would probably dive on the liver mousse. Last Saturday night I had duck mousse for my starter in a very nice restaurant - it was Devine!!! Ya, you couldn't talk me into making or eating any of these recipes. Prune whip? Is that for us old constipated folks?? I don't think I would like to taste test them. 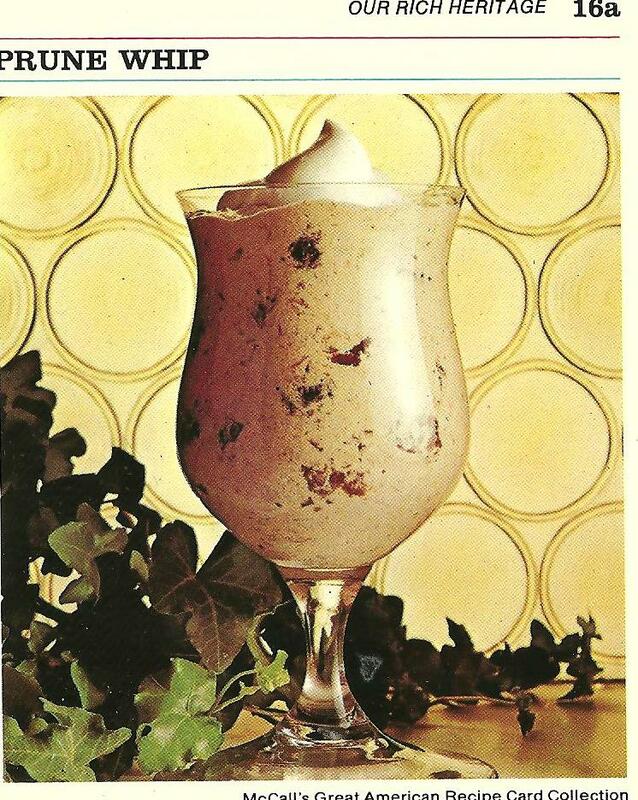 That must be a vintage smoothie. I do love old cook books. They just bring back old memories. Thanks for sharing. While I've never had them, I have heard of the first two. The prune whip is new to me. I'll pass too! oh, these made me laugh!!! yep, those all sound pretty disgusting! They are all good if you are hungry enough! My husband's grandma was a big fan of "drunken chicken livers" which were something she brewed up in her crockpot for holidays. The stench was really overpowering. 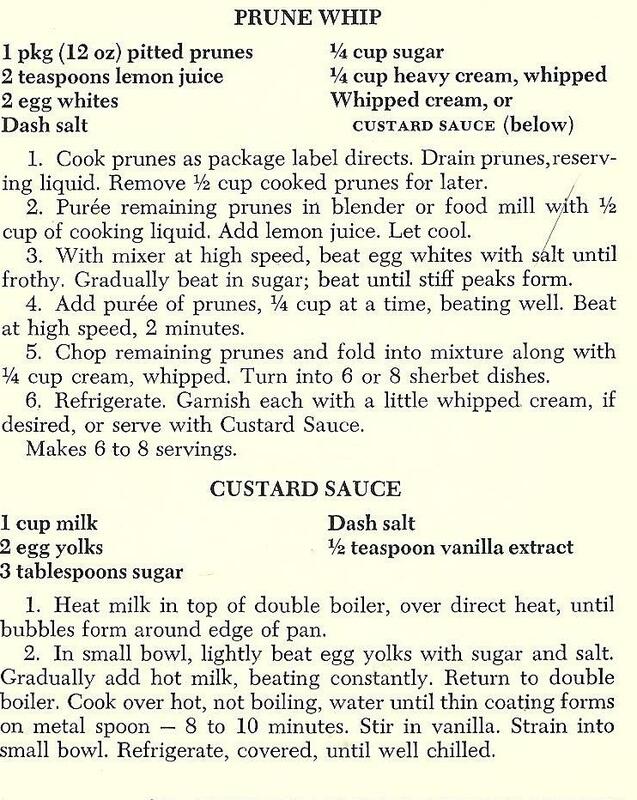 Prune whip--gee whiz that sounds awful! How lucky that you have access to old family recipes, I love that fact!! I am So GLAD to know that I am not the only one that actually reads GROSS recipes!!!! You found some 'good' as in really BAD ones!!! :) One of the best worst ones I found recently was 1 cup mayo per chicken breast, no seasonings cook covered until meat is just slightly pink. GROSS But I think your Prune Whip has won the blue ribbon hands down!!!! I could do the prune whip, but not sure I could do the chicken livers. My Hubs loves chicken livers so he might like it. Lisa, this was so much fun! I want you to do it again if you can find enough awful recipes. NONE of this looks good and now we know why people died so much younger back then. The prune whip looks like vomit, and the aspic like jelled blood, truly the food of the Addams family! GREAT fun today! I actually think the prune whip doesn't look too bad! But the other two - yikes! It's funny to look through old cookbooks from the 70s to see what was popular. No, I can live without these olddies. You were right. Prune Whip... Oh Cmon Really???? My mom had stuff like this. It seems more about how creative can you get with anything leftover in the cupboard... ;) probably was. OMG, these look awful. Prune whip? HA! The stuff people used to eat! Although, hummus and tofu might look disgusting in a decade or two! Funny post!